I stumbled across the Talking Pictures TV channel recently, and it's proved to be a real find, featuring plenty of obscure and rather interesting movies. 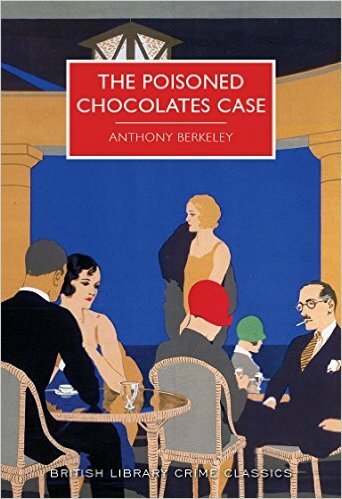 A prime example is a classic whodunit, absolutely in the Golden Age style, and based on a story by a Golden Age writer who deserves to be better known. The film is Three Steps in the Dark, and the writer was Roger East - the pen-name of Roger Burford, who focused on screenwriting after starting off as a novelist. The film was made in 1953, but it looks very much like something written and made twenty years earlier. It's a black and white film with actors mostly unknown to me, and I wonder if it seemed very dated even when it was made. Apparently it had a limited release and was feared "lost" until quite recently. But I'm really glad that it's been retrieved. I've read enough whodunits of this type to be able to spot the villain, and I did so on this occasion, but it didn't spoil my enjoyment. Yes, this film really is a period piece, but it doesn't outstay its welcome, and the woman detective novelist who solves the puzzle is a rather pleasing character. She reminded me slightly of Louie, wife of East's amateur detective Colin Knowles. East is certainly a writer I'd like to know more about. The Doll, written by Francis Durbridge, was a highly successful TV series when first screened in 1975. Durbridge has always been very popular in Germany, and happily the German DVD of the series, which is now available under the title Die Puppe, can be viewed in the original English language version. Durbridge, an economical writer, later turned the script into a novel, which I reviewed on this blog seven years ago. Watching the DVD, and having forgotten most of the plot twists in the interim, I found myself enjoying the story all over again. The baffling set-up is quite splendidly done, although as I said in relation to the book, the solution (and the explanation for the part played in the story by the mysterious dolls) is a bit of a let-down. Never mind: this is often the case when the premise of a murder puzzle is quite dazzling, as with so many of the stories by Cornell Woolrich or Boileau-Narcejac. John Fraser plays publisher Peter Matty, who becomes besotted with a woman called Phyllis whom he meets in Geneva. Given that the actor playing Phyllis is Anouska Hempel, his infatuation is easily explained. She must have been one of the most beautiful stars of her generation. 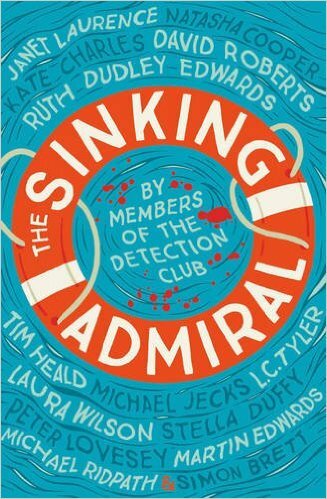 All the more frustating for Peter, therefore, when she disappears mysteriously while on a trip to the Isle of Wight. The complications come thick and fast. Why did Phyllis lie about her trip to the island? Why did her photo appear in a shop window, and then get replaced with a photo of another woman? Why did a doll appear floating in Peter's bath? What is the secret nursed by dodgy journalist Max (played by Derek Fowlds, of all people)? And so on. Whilst I did find some of the answers to these questions a bit unsatisfactory, the pace of the story meant that I didn't mind too much, and the inclusion of one of my favourite songs, "The Look of Love" was an unexpected bonus. . Overall verdict: great light entertainment. . The British Library has published its catalogue of forthcoming publications for the first six months of next year, and it's full of treats. Several of them, I need hardly add, are to be found in the Crime Classics series! As usual, the BL has come up with some lovely covers. It's unusual for paperbacks to attract collectors, but I know that a good many people are collecting the series, not only because they enjoy classic mysteries, but also because these books are lovely to look at. I'm delighted that Verdict of Twelve, by Raymond Postgate, is making a reappearance after an unaccountably long absence from the bookshops. Julian Symons and Michael Gilbert were among its admirers, and I think it's a terrific novel. There's also a novel by Lois Austen-Leigh, The Incredible Crime, which I look forward to reading. It was discovered by Kirsteen Saxton, who has written the intro. Two books by Anthony Rolls (a pen-name for C.E.Vulliamy) make an appearance. First comes Scarweather, then Family Matters. Rolls, like Postgate, was an ironic stylist whose work shows the influence of Anthony Berkeley (in his Francis Iles incarnation) yet is truly distinctive. 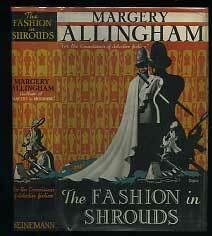 I'm not aware of any UK editions of these books since their first publication in the early Thirties. And then there are two anthologies of mine. The first is Miraculous Murders, a collection of locked room mysteries and impossible crimes. The second is Continental Crimes, which gathers mysteries set in continental Europe. There are several little-known and fascinating stories in each book, and I'm really looking forward to their appearance. 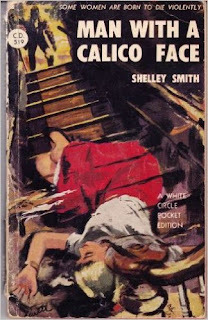 I've written here previously about my enthusiasm for the crime fiction of Shelley Smith, the pen-name of Nancy Bodington, nee Courlander. That interest was originally fired by Julian Symons, a long-time admirer of her work, who heaped praise on her in Bloody Murder, and subsequently shepherded that brilliant novel An Afternoon to Kill back into print in a series of Collins Crime Club reissues. Man with a Calico Face is a fairly early book, first published in 1951 and it's hardly ever been mentioned on the internet. I did, however, find a link to a negative contemporary critique in Kirkus Reviews, which moans about the unpleasant nature of the characters. This is a complaint often made about the books of Francis Iles, whom Symons and I both admire, and although there is a grain of truth in the complaint, I think it's overdone in relation to both Iles and Smith. Like Symons, I think that Smith's work occasionally betrays Iles' influence, and that is especially true of the final twist in this novel. The structure of this novel is extremely interesting. After the set-up section, there is a section which delves into the past, before we come back up to date again. This is the same structure that Henry Wade used in the masterly Lonely Magdalen, and although I don't think this book is as good as that one, it's certainly intriguing, and after a slow start builds to a highly dramatic and ironic climax. And who is "the man with a calico face"? We don't find out for a long time, but the explanation rather pleased me. Not Smith's best book, for sure, but definitely worth a read.. 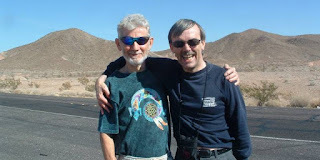 I was truly sorry to learn that Tim Heald died last Sunday, at the age of 72. Tim was a man of many parts, and novel writing was only one of the strings to his bow. He worked as a journalist, wrote biographies, cricket books, and books about royalty, and was a popular public speaker on a wide range of topics. He was also an entertaining crime writer, best known for the Simon Bognor books, which were televised, and he chaired the Crime Writers' Association. He was immensely convivial. I'd been in touch with Tim by email for several years before I first met him in person, whilst he was on tour in the north, speaking at various cricket society functions. I took him for lunch at Liverpool's Athenaeum Club, where he regaled me with tales of his experience of the TV world (enough to make you want never to have your books televised) before presenting me with inscribed copies of several of his books, which I treasure. I also had the pleasure of including a couple of short stories he'd written in anthologies I edited. 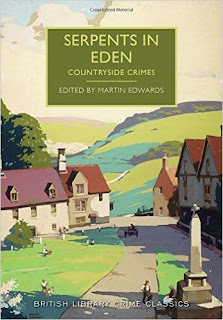 Years earlier, he'd edited a first rate anthology, A Classic English Crime. Most memorable of all was a weekend I spent with him in July 2012. This was at the Kidwelly e-Book Festival, an extraordinary event where attendance figures did not exactly match the organiser's laudable ambitions. Most of the time, authors outnumbered attendees, but Tim's company was one of the things that made the whole weekend remarkably pleasurable. The photo shows him in the beer garden of the Red Lion in Kidwelly, where we recovered from the experience of the festival before enjoying a good many laughs over dinner.. The last time I saw Tim was in March last year, at the CWA conference in Lincoln. By that time, sadly, he'd been stricken with illness, and was not very well at all. 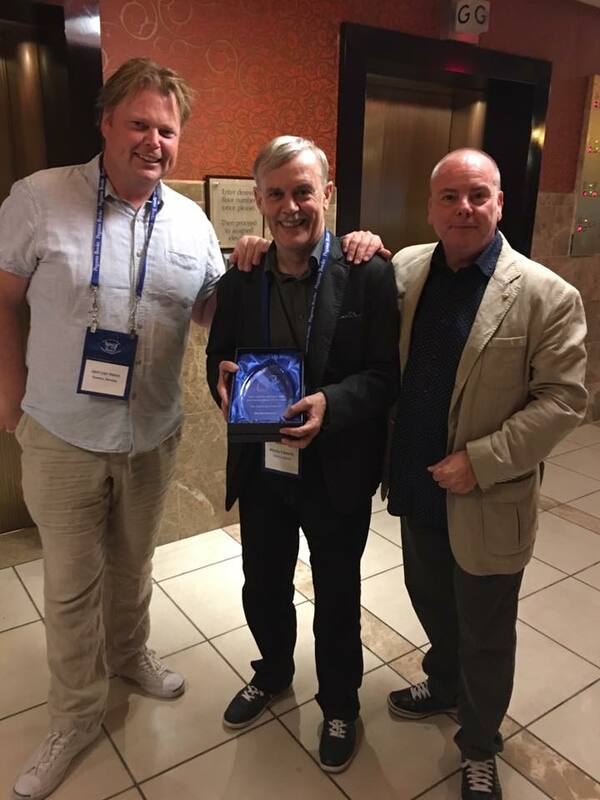 Some years earlier, Tim had seconded the nomination that I be elected to the Detection Club, and he expressed his delight that I was to become the Club's President later in the year.. I asked if he thought he might be able to attend and he shook his head. But with a twinkle in his eye, he said, "I'll be there in spirit." And so he was. Fireside Gothic, recently published by Harper Collins, is a hardback collection of three novellas by Andrew Taylor. 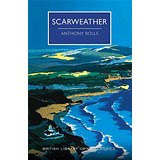 Andrew is one of those writers of my generation (Ann Cleeves and Peter Robinson among the others) whose books originally attracted my attention when I was hoping to get a novel published. I wanted to see what newish authors of roughly my vintage were up to. Like Ann and Peter, and indeed before them, Andrew was writing books that I not only admired, but more importantly enjoyed. And like them, he's gone on to become one of our leading crime novelists. He's also someone who writes excellent short stories (do please check out his contribution to Motives for Murder, the brilliantly titled and very entertaining "The False Inspector Lovesey"). The three longish stories in Fireside Gothic originally appeared as Kindle Singles. It interests me that a leading writer should try this different, and enterprising, way of publishing material that's some way removed from his current novels, and it strikes me as a very good idea. But I'm glad it's now possible to read these stories in a single, elegantly produced volume. The book offers a reminder of Andrew's versatility. He's probably best known for his historical crime fiction, and for his willingness to tackle a wide range of different historical periods, but his contemporary work is also very varied, and that is a real strength, My favourites of his books are The Roth Trilogy aka Fallen Angel, The Barred Window, and Bleeding Heart Square, but there are plenty of other good ones to try if you are new to his work not least the Lydmouth series set in a post-war market town. He even wrote five Bergerac tie-ins under a pen-name. In Fireside Gothic he ventures into what I'd call Robert Aickman territory (and I've written several times here of my enthusiasm for Aickman; I've even produced one story of that type myself, "Through the Mist", which appeared in Starlings). Andrew's strange stories have some linking themes, but are quite distinct from each other. "Broken Voices", a Christmas story with a historical background, is closest to the classic type of supernatural story told by M. R. James. "The Leper House" benefits from an evocative setting in East Anglia, while "The Scratch" is perhaps my favourite of the three,given the number of levels on which you can interpret it. All in all, first-rate fireside reading. A couple of weeks ago, I spent an enjoyable evening at the British Library. 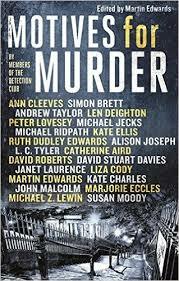 Mark Lawson was interviewing Ann Cleeves and me on the topic of "the return of the Golden Age of crime fiction". Ann is a contemporary writer working in the vein of the traditional mystery, and very successfully too. She talked about her take on Golden Age writers - though she's not such a fan of Agatha Christie as I am, for instance - and about how, on occasion, there are GA elements in her work. An example is The Glass Room, a very good book featuring Vera Stanhope. 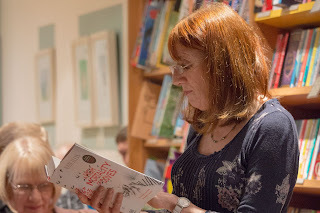 The event came, for her, at the end of a hectic tour promoting her new book, part of the Jimmy Perez series this time, Cold Earth, which is published by Pan Macmillan. This is her 30th novel, and Maura, her publicist, arranged as a surprise a video with contributions from a wide range of writers, including Ian Rankin, Val McDermid and her colleagues in Murder Squad, congratulating her on the milestone. A nice touch. When recording my snippet, I took the opportunity to take a look again at her very first novel, which was certainly in the GA tradition, and it was pleasant to reflect on the progress she's made since those early days. In Cold Earth, excellent thematic use is made both at the start and the end of the story of earth as a powerful elemental force. The book opens vividly with a landslide on Shetland which coincides with the funeral of a character encountered previously in the series, and which causes considerable havoc. When rescue operations get under way, a body is discovered. But, surprise, surprise, the deceased did not die of natural causes. The corpse belongs to a woman, and there is some mystery about her true identity. A key feature of the book is the development of the relationship between Perez and his boss Willow Reeve. In this story, we get a fuller picture than before of Willow s personality, and it is an appealing one. 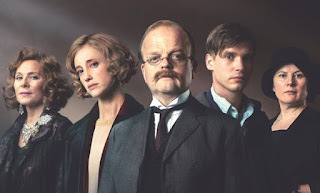 There is some debate - especially among people who like Golden Age fiction - about whether modern writers spend too much time on exploring the personal lives of our detectives. Some people prefer us simply to get on with the story. E.C.R. Lorac was not one of the Golden Age's most famous Crime Queens, but she was, perhaps, a Crime Princess. Not quite Christie, Sayers, or Allingham, but a very good writer of detective fiction nonetheless. My parents enjoyed her books in the Fifties, and I used to buy old copies for them when I came across them in catalogues or shops. Having eventually inherited the books, I'm now working my way through them. 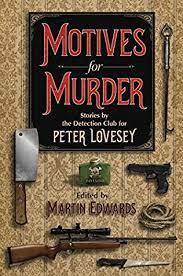 Fellow Lorac fan Geoffrey McSkimming told me that Murder by Matchlight is one of his favourites, and it's my Forgotten Book for today. A young analytical chemist is at a loose end one evening after his girlfriend is unavoidably detained elsewhere. He wanders into Regent's Park, and when someone strikes a match to light up the darkness for a moment, in the matchlight he sees a man with an unusual face. He also hears a thud - and guess what? Someone turns out to have been murdered. 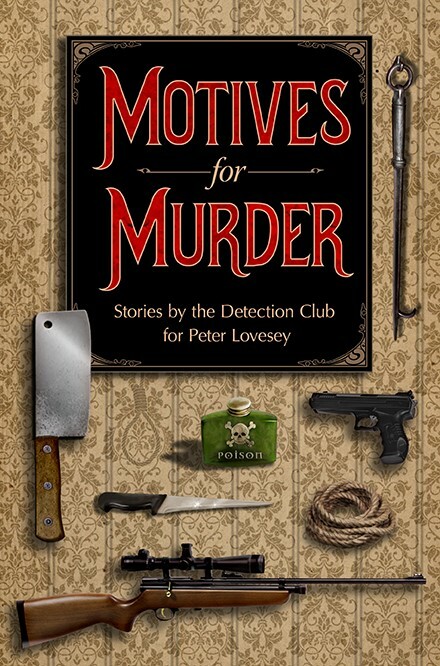 Lorac's regular cop, the amiable but persistent Macdonald, leads the investigation, and finds that the deceased was himself a man of mystery, masquerading under an assumed name. A varied cast of suspects includes a conjuror called Rameses, who lived in the same building as the dead man; fellowtenants also come under Macdonald's microscope. Suspicion shifts around from nne person to another until a satisfying solution is put together. A good mystery. 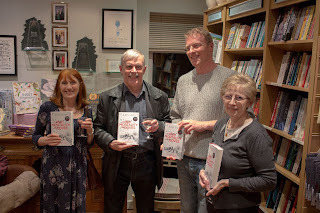 Last night I had the pleasure of attending the launch, at Simply Books in Bramhall (a very good indie bookshop, by the way) of Kate Ellis's new book.A High Mortality of Doves is published by Piatkus, part of the Little, Brown group. 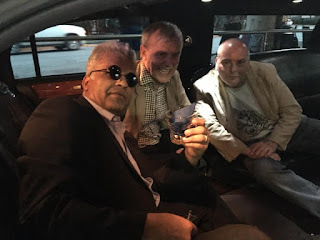 My companions included fellow crime writers Margaret Murphy and Chris Simms, who are, like Kate and me, members of the Murder Squad group (see below photo). It was a convivial occasion; the photos, by the way, were taken by Kate's son Tom. Kate is a friend of mine, and so you would expect me to be favourably disposed to her work, as I am. For a good many years, I've believed that she is a writer whose ability to develop the traditional detective mystery story in interesting ways is under-valued. Years ago, I thought the same about some of my other favourite writers - Peter Robinson, Ann Cleeves, Ian Rankin, and Andrew Taylor .That quartet are all bestsellers now,and deservedly so. I look forward to Kate joining their ranks. A High Mortality of Doves marks a departure for her. It's set in the aftermath of the First World War, and the backdrop is Derbyshire, a gorgeous county, home of lovely landscapes (and unlucky cricketers). I know that, in researching the book, Kate visited the military hospital exhibition at Dunham Massey, a marvellous National Trust property near Altrincham, which told the story of how wartime casualties were treated. I visited Dunham Massey too, and found the whole experience very moving. I don't want to say too much about the plot of the book, which boasts a dramatic revelation at the end. I didn't see it coming, even though I'd anticipated one aspect of the solution. When the book has been widely read, I look forward to debating the craft involved in coming up with that particular twist. In the meantime, watch out for A High Mortality of Doves. I suspect that it will be Kate's breakthrough book. 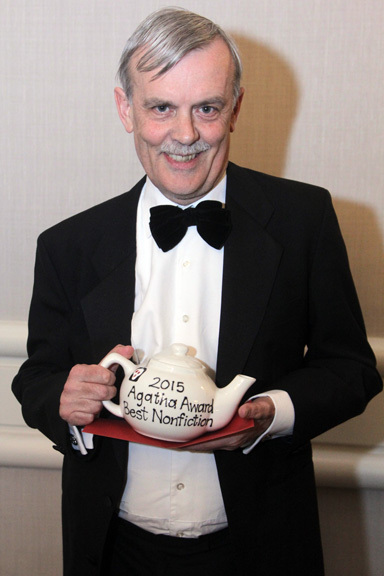 On Thursday evening I had the pleasure of presiding over an unforgettable evening at the Dorchester Hotel. 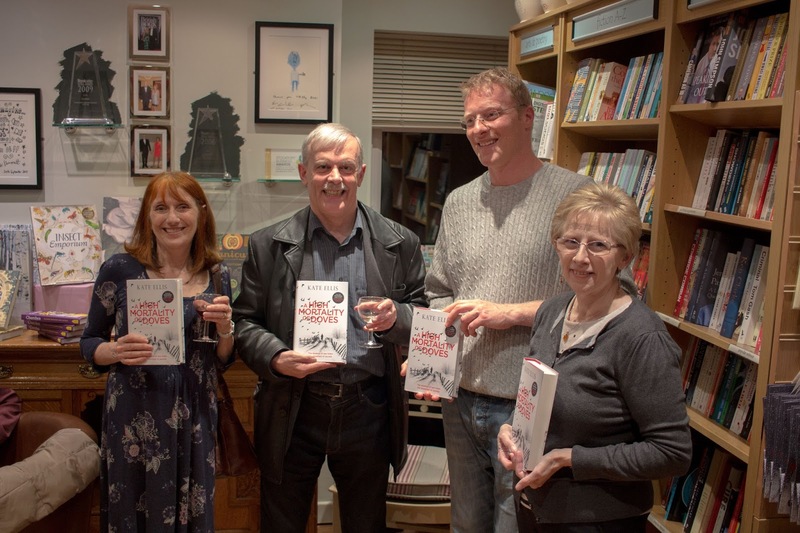 It was the Detection Club's November dinner, which proved to be a sell-out, with a speech from distinguished former crime fiction editor Hilary Hale and the induction of two new members - James Runcie and Mick Herron. Guests included visitors from the US and members of the family of Ronald Knox, one of the Club's founders. We also celebrated the recent 80th birthday of that wonderful writer Peter Lovesey, who has been a member of the Club for over 40 years. I admired Peter's books long before I met him, more than a quarter of a century ago, and when I suggested to Club members that we celebrate him in a practical way by producing a book in his honour, the response was overwhelmingly positive. 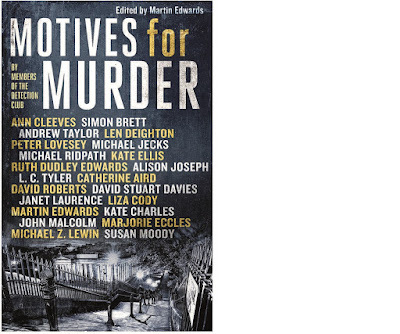 And the result has just been published - a book called Motives for Murder. The UK edition, published by Sphere (front cover above), was presented to Peter by David Shelley, once my own editor (and now J K Rowling's!) and the man who first commissioned my Lake District series. 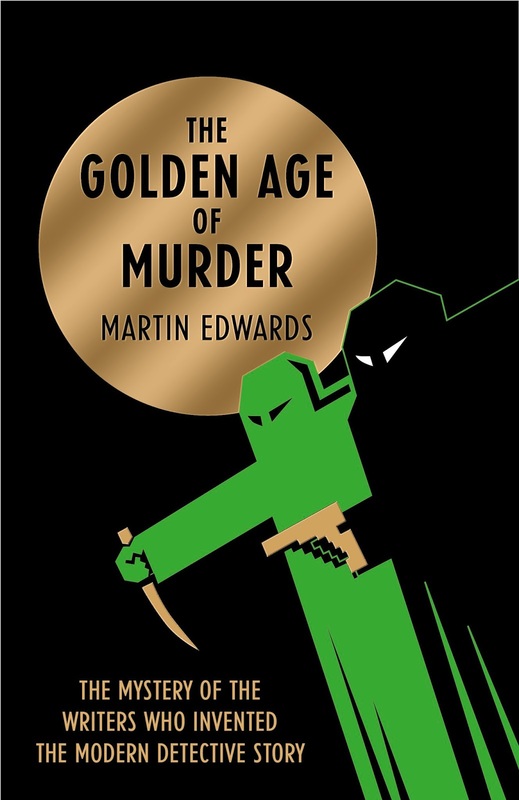 The US edition, published by Crippen and Landru (front cover below), was presented to Peter by Doug Greene whose own contribution to the genre includes a splendid biography of John Dickson Carr. Len Deighton has written a foreword to the book, and Peter himself has supplied a fascinating afterword, detailing his memories of his early years in the Detection Club. 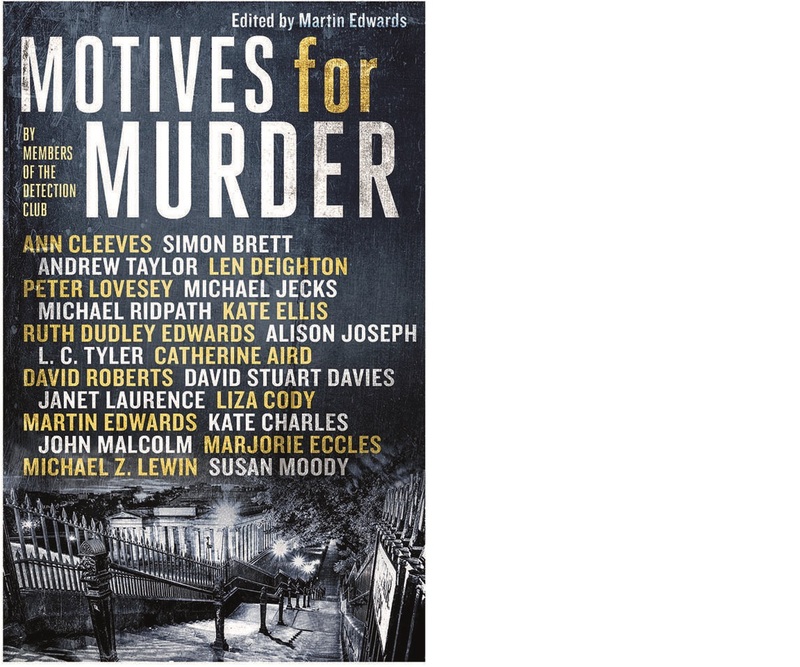 Ann Cleeves, Len Tyler, Kate Charles, Ruth Dudley Edwards, Susan Moody, Andrew Taylor and Liza Cody are among the galaxy of talented writers who have written brand new stories for the book - while Simon Brett contributed a sonnet. An added twist is that the stories (and the sonnet) are connected to Peter's life and work in one way or another. 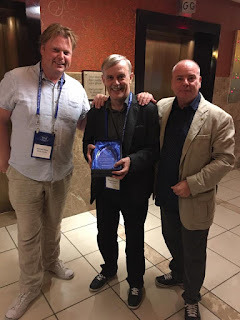 The result is one of the most satisfying anthologies I've been concerned with, and a fitting tribute to one of life's good guys (who treated us on Thursday night to a wonderful rendition of his witty poem about autopsies...) It was a truly memorable occasion.